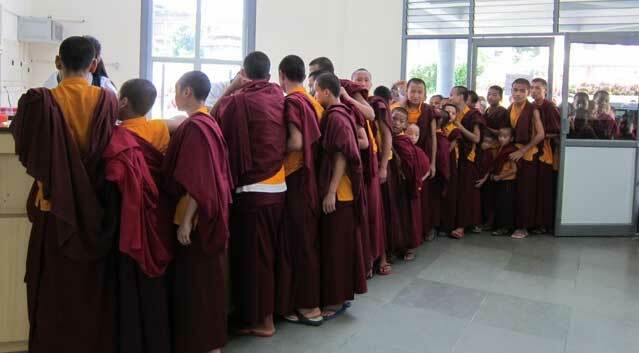 On 3rd November 2010, amongst the Hepatitis B negative patients, 917 monks and nuns of Namdroling Monastery who have not received Hepatitis B vaccination before were given the first dose of vaccination under the sponsorship of Siddhi String Society, Hong Kong. The second dose will be given on 3rd December and the third dose will be given after six months. On 27th September to 9th October 2010, a total of 2917 monks and nuns as well as laypersons were screened for Hepatitis B at the Golden Temple Hospital with the support of Zydus Cadilac Company. After the screening, 2780 were found to be negative and 137 were found to be positive. On 4th November 2010, 50 nuns from Tsogyal Shedrupling Nunnery, a branch of Namdroling Monastery were examined by Dr. Jayanthi, a gynecologist from ColumbiaAsia Hospital, Mysore Branch. This was also organized with the support of Siddhi String Society, Hong Kong. Mrs. Susan Sim and Linda were there to oversee the program. With their support, monthly gynecologist camp will be conducted in order to improve the over all health of the nuns.